Do you have items which you want to keep in storage instead of throwing away? If you do, then you should give us a call as we are licensed contractors with numerous years of experienced behind our backs. We are known to provide the most reliable storage services in London. Get your storage cell now! Our facility is open 24 hours a day which means that our clients have constant access to their belongings. Know that you don’t need prior reservation in order to book one or several of our cells. However, we do require a seven-day notice (fourteen-day notice for extra-large units) before you vacant the storage space that you have rented from us. Our storage cells range in size and are equipped with the latest and most dependable environmental systems. This means that your belongings will constantly be protected from the natural elements. We have both interior and exterior units, so it is up to you to decide which type of storage space will best suit your personal needs and preferences. Down below we have listed the dimensions of our cells. For us from Sky Removals safety is of great important and this is why we have mounted top notch alarm system in all our storage units. We have also hired an experienced and well-trained security staff to guard our facility 24 hours a day, 7 days a week. So, if you are worried about the wellbeing of your possessions don’t be because we promise you that we will guard them as our own. We provide our London storage services at cost effective prices. In fact, we are currently credited to be the contractors that work with the most reasonable rental fees in the city and this is a recognition that makes us proud as it means that our clients are happy with our quality/price ratio. You can see how much renting a storage cell will cost you by giving us a call and requesting a free quote. 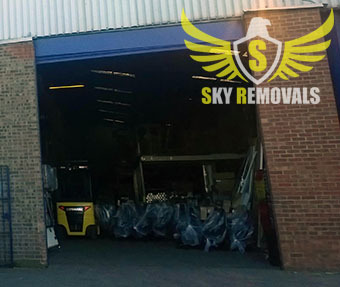 Sky Removals also specialises in several more services and you can learn more about them by either exploring our website in full or getting in touch with our phone operators. Our consultants will present you the additional information that you seek and will provide you detailed answer to all your questions regarding your storage services, removal options or methods of work.